While I was pregnant I read a ton of “birth stories” on blogs hoping to glean some sort of wisdom as to the process of bringing a baby into the world. As such, I sort of feel like I should share my own-albeit a PG version. My parents’ friends sometimes read this blog, don’t want to make things awkward. Tuesday, the 26th, Chris and I visited my doctor for my 39 week appointment. Doc told us that I was 2cm and 40% effaced and offered to induce me on Wednesday since he would be on-call Wednesday night and on vacation for my actual due date August 1st. I told him thanks, but no thanks and reminded him that I was pretty sure our little Will was going to come early on his own. I half-jokingly said “see you tomorrow!” on our way out of the examination room. Wednesday Chris and I spent a perfect, quiet, lazy morning in bed, snuggling and enjoying our last morning as non-parents, not that we knew it at the time. By the time we got up, I was feeling something like cramps but since they weren’t at all painful and were pretty far apart, we just assumed it was false labor and told his parents on the phone that there was no news. Except during the day they got more frequent. And more telling-I wasn’t hungry. I am ALWAYS hungry and the fact that I wasn’t eating anything seemed suspicious to me. As the cramps got closer together, I realized we might be in for the real thing so I tried to stay on my feet as much as possible to help things along, baking cookies, granola bars, and dulce de leche cheesecake bars (fabulous recipe!) while Chris attempted to sleep off the last dregs of jet lag. Around 7pm I realized that maybe I should pack a bag for the hospital. At about 8pm I woke Chris up from his nap as my “cramps” were now about 6-8 minutes apart and, while still not horribly painful, they were definitely more noticeable. After hemming and hawing for a few hours over whether my now 5-minute-apart cramps were worthy of a trip to the hospital, my mom finally drove us in around midnight. My mom is a neonatal nurse practitioner at the hospital I was delivering at and was on call for c-sections that night so it worked out that as soon as she dropped us off, she got a call and headed to her c-section. She was scheduled to work the next day, Thursday at the hospital I was delivering at so the plan was for her to come back and sleep at the hospital until either something happened or her day shift started-whatever came first. My doc measured me at 3cm when we came in and promptly broke my water at around 1am. My dad stopped by but we sent him back home. The average first time mom progresses at a pace of 1cm per hour so we were convinced that it would be a looong time before anything exciting would happen and wanted him to get some sleep. I labored for the next 3 hours. I wouldn’t call it a pleasurable experience, but it was bearable. I thought I’d want to listen to music but mostly I just wanted to pace back and forth and hold Chris’ hand. The worst part wasn’t so much the pain but the way my legs kept shaking uncontrollably and the few times I puked up all of the liters of water I had just gulped down. All in all though, I was feeling alright and hopeful that I could get through without any drugs. I tried to just keep thinking about how every contraction was bringing us closer to meeting Will. I didn’t have any better strategy or jedi mind-tricks than that. At 4am the nurse came in to measure me and said I was at 4.5cm. I could hardly believe it, only 4.5. Finding out that I’d only made 1.5cm of progress in 3 hours was a bit of a blow to my confidence that I could make it through sans drugs, but I vowed to keep trying. Just 10 minutes later though I was on the floor of the bathroom, shaking and rocking back and forth in some serious pain. Previously I’d felt ok between contractions, now there was no relief. The contractions were coming one on top of the other and the growing sensation of pressure and pain in between them seemed unending. I was so irrationally paranoid about pooing on the delivery table or in front of Chris that the bathroom became my favorite place to labor. I stayed on the floor trying desperately not to make any scary labor noises, but if this was only 4 cm, I thought there was no way I was going to make it to 10 without fainting or harboring some serious resentment towards my son. When the nurse asked me if I was finding my happy place, I asked for the epidural. The thing about epidurals though is that its a 2-3 hour process to get one. If you plan on waiting until you can’t stand it anymore to ask for your epidural, apparently you might want to reconsider. I spent another half hour on the floor of the bathroom on my hands and knees waiting for the IV bags to be ready, feeling an ever growing sensation that something desperately needed to come out down there. Up to this point I’d been pretty silent through contractions but now I heard myself crying out like someone I didn’t recognize. I wouldn’t let Chris in the bathroom before but he rushed in now. I apologized for being a wimp and a prima donna (ha! literally!) as I limped over to the bed to get hooked up to the IV. 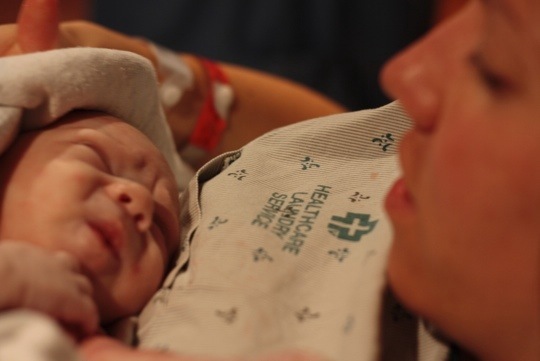 I couldn’t believe I was getting an epidural at only 4cm. I always told myself I wouldn’t beat myself up for needing pain medication but I sort of figured I’d have persevered longer without it. As I crawled into bed, I off-handedly mentioned to the nurse that the feeling like I needed to push was almost worse than the contractions, and she offered to check me again, just in case. According to Chris she almost jumped back from the bed after checking me. I was 9.5cm, almost 10. I had gone from a 4 to a 9.5 in 45 minutes. All of sudden the room was filled with nurses and extra tables and I could hear the note of restrained anxiety in our nurse’s voice as she asked whether my Doctor had been paged and how long it would take him to get in. Then I heard her tell someone to page him twice. Realizing exactly how productive the past 45 minutes had been suddenly made me feel loads better. My sense of humor returned, albeit dryly, in between contractions and I weirdly enough started giving Chris a rather intense shoulder massage as a way to get through the contractions while being forced now to lie in bed instead of on my beloved bathroom floor. The contractions though were a bit scary as we waited for the doctor. The desire to push was so strong but so was my fear of accidentally pushing the baby out before my doctor could get there. I kept asking how far away he was, I asked whether I could just have the baby without him. The nurses thought I was making another joke but I totally wasn’t. I wasn’t sure how much longer I could keep resist the insane urge to push Will out into the world. I clung to Chris fiercely and heard almost nothing except his quiet encouragement to relax and breathe. He was wonderful, by the way. The best partner I could ever ask for. He’s also the reason we have such beautiful photos from the first few moments after Will’s birth. He picked up my camera and wielded it like a pro. I tried as hard as I could not to push but as the doctor burst in the door I couldn’t take it anymore, Will’s head emerged just as the Doctor threw on a scrub top over his jeans and t-shirt. Approximately 30 seconds later, the rest of Will slid into the world and he landed on my chest at 5:08am. 4 hours after we arrived in our hospital room, 15 minutes of inadvertent pushing later. Someone once wrote that pushing their baby into the world was one of the most wonderful experiences they’ve ever had and I’d have to agree. Physically it’s just a feeling of instantaneous, sweet relief, but it’s also something even more. Chris says the first thing I said as they put him on my chest was “Oh! I love him!” It was as if the whole world changed. I could stop crying and laughing, kissing and touching him. The resentment I imagined I’d feel against Will for the pain of labor now seemed laughable, absolutely absurd. I repeated his name over and over again as Chris and I both just stared at him in total awe. I can’t describe the moment with words. I wish I could but I can’t. Chris says he had never seen me look as happy as I did with Will on my chest, holding his little hands and kissing his head, delivery muck and all. It’s true, it was happiness but in a form more raw and powerful than I think I’ve ever experienced. Will didn’t cry at all when he came out. In fact, he only made one little cry until they finally took him away 15 minutes later to weigh him and check him over. He was so quiet, but alert, gazing around the room and up at Chris and I, taking it all in. 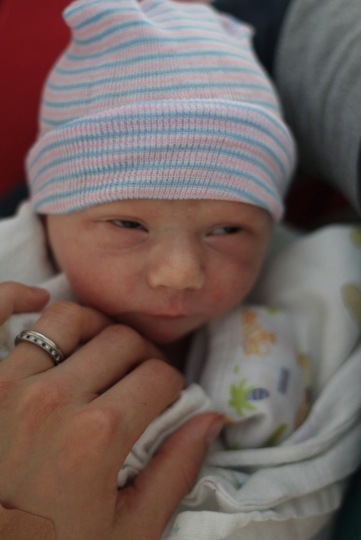 He’s still not much of a crier and still likes to gaze around the room looking like he’s thinking deep baby thoughts. All in all, I consider us very, very lucky. Will came out a little smaller than we expected, 6 pounds, 5 oz and with the cord wrapped around his neck but he still came out healthy and strong. Two weeks later, he’s already up over 7 pounds and his cheeks are getting nice and chubby. I also consider myself insanely lucky to have had the easy, quick, and trouble-free labor. All I wanted going into the experience for myself was to avoid pain medications and avoid getting cut up by the doc. Will came so quickly, I was able to avoid both save for a little tearing and a few stitches. With the endorphins flowing so fiercely after Will’s birth and the world’s cutest baby in my arms (in our humble, biased opinion) I didn’t really feel anything but totally high on Will until at least 24 hours later and by then, some ice packs and some Advil were enough to get me through the first rough few days. I was very, very, very lucky. So yea, that’s how we got our Will. Before him, I scoffed at people getting overly sentimental about their children’s births, now I totally get it. I’m as guilty as anyone now of whispering into my baby’s ear late in the night about how happy he made us when he joined us in the world. oh goodness. I was ever so thankful that you sent me the abbreviated FB version the other day, but this is so sweet and deeply satisfying to read!! Thank you for sharing your experience. He is incredibly, perfectly beautiful. Nicely done, you. At 40 weeks and 5 days…I spend many a teary-eyed afternoon scouring the internet for birthing stories hoping they will somehow prepare me for what (I HOPE AND PRAY) will be happening in my world very soon. Would you be willing to share some of your favorites? Love and blessings to you and your sweet guys! Can’t tell you how much I loved this! 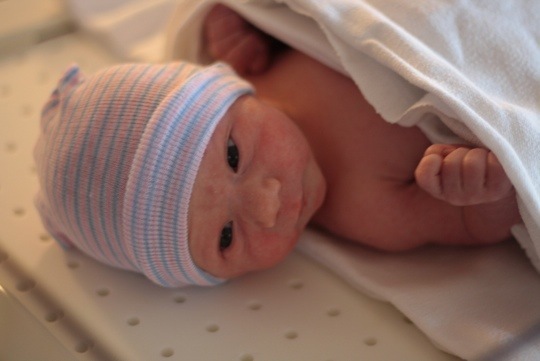 Thank you for sharing all the juicy details – I am hooked on birth stories right now!!! Congrats on making it through without meds — gives me hope that I too can do it! Hi Eve, I think I scoured BabyCenter pretty well and read a website called “Everybody Births” about 3 times. I’ll be thinking good labor thoughts for you guys!! Loved reading the details of Will’s birth. Yey for you for making it without drugs!